Only at Melloblocco. Rumors had been out since yesterday: this morning’s MelloYoga would take place on top of Sasso Remenno for a special sun salutation. There had been no official announcement, just word of mouth. This came as no surprise, for this is how things work here: free climbing unleashes the most unlikely ideas and fantasie. The real question was: how many would show up, after Friday night’s party, at the foot of the Valley big stone? And, was it really true? As it happened, this morning many, many gathered at the base of the giant. They were awaited, after the climb to the top, by the (enchanted) summit garden. The view from here dominates the valley, everything feels suspended and magical… So much so that the yoga sessions were split into two shifts, for an unforgettable sun salutation. As unforgettable as this morning’s wake-up call or, if you prefer, MelloBaby sun salutation.At least 50 boys and girls of all ages turned up for the appointment on the lush Mountain Center lawn. They began with a quick (and useful) lesson about „oral hygiene”, namely how you use a toothbrush. They then made their way to the Collinetta crag where their instructors and mountain guides Luca Maspes and Daniele Spini began by teaching them how to brush the holds, before „launching“ them up the vertical playground reserved for the smallest Melloblockers. Despite their age they impressed everyone, and proved once again that they’re champions at playing and having fun. The same holds true for the children who participated in the afternoon shift who (unluckily) had been at school in the morning. They seemed to accept the after-school activity with dedication, enthusiasm and, like all good Melloblockers… climbing galore. Talking about Melloblockers. Throughout the morning the queue at the registration desk never came to an end. Which meant that, when all things were said and done, another thousand climbers arrived, bringing the tally to 2,500. Meanwhile the atmosphere, you could say Karma even, of Mello in 2016 continued to be particular. It’s hard to describe, one has to be there. Perhaps it’s because of the sun, or simply because it’s Melloblocco, but this year what seems to reign supreme is… peace, a relaxed tempo, pure and simple fun. Even, and especially, when climbing. All boulders, wherever you went, whichever caught the eye, were being climbed by someone. All in accordance to to the free Mello mantra. This elusive spirit was inspired perhaps by the beauty of this valley, that seems to have conquered all. Even the champions, those committed to sending the magnificent 12 + 12 prize money problems. Some of the new problems have resisted all attempts, others have already been conquered. Tomorrow – when the games come to an end – we will know more. In then meantime though many pleasant and often unexpected faces turned up, such as legendary Cristian Brenna (and family). And climbing master Stefano Alippi. Always superb Giovanna Pozzoli. Slovenian champion Maja Vidmar. 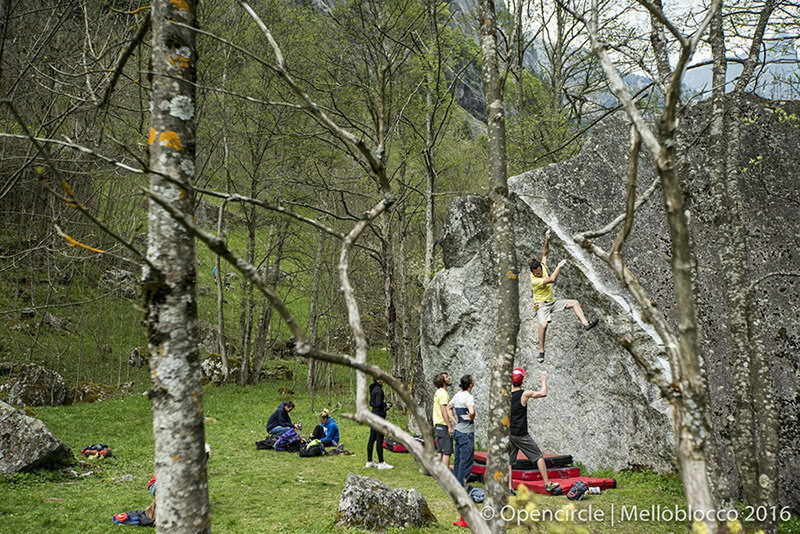 And, directly from Switzerland’s Magic Wood, magical Gabriele Moroni who just sent an 8C boulder problem. Perhaps this desire to be here, no matter what, is part of the Mello karma. This evening the Saturday night party will unleash to the notes of Circo abusivo, a group which has become an integral part of Mello.